John Bogle, founder of The Vanguard Group, died on Wednesday at the age of 89. Jack Bogle, the founder of Vanguard who made investing and retirement affordable for millions, died Wednesday at the age of 89, the company said. Bogle transformed the way people invest their money when he created the first index mutual fund for individual investors in 1975. He believed that investors should own a mix of bonds and stocks but shouldn't pay investment managers to pick them, so he created funds that represented a basket of stocks, such as those in the S&P 500 index. To see the impact he has had, you need to look no further than your own retirement account — chances are you have more money in there because of Bogle. That's because by creating that first index fund back in the 1970s, Bogle started a revolution of super-efficient low-cost investing — taking on Wall Street firms and the high fees they charge investors. Bogle also became a champion for the little guy investor, perhaps because he knew what it was like not to have enough money. 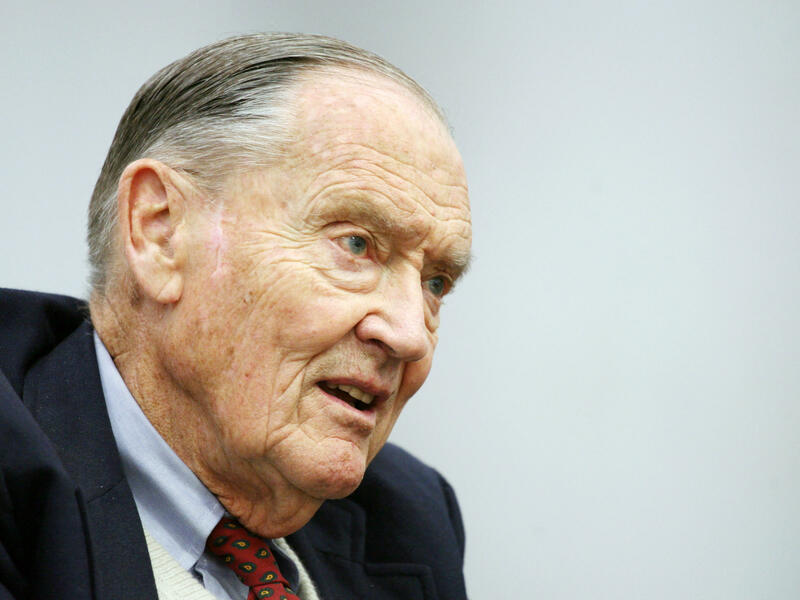 His family lost everything they had in the Great Depression, "so I grew up having to earn what I got, help out with family expenses," Bogle told NPR several years ago. "I started working when I was 9 years old." Today Vanguard, the company Bogle founded, manages more than $5 trillion. Some of that could be your retirement savings. And the firm is structured essentially as a nonprofit. "We live in this mythical world where we kind of believe the American way is if you try harder, you will do better — that if you pay a professional to do something, it will pay off," Bogle told NPR in 2015. "And these things are true — except in investing!" He realized that the stock market doesn't really have that high a return. So the fees people pay have an enormous impact on their investing returns. "Cost turns out to be everything," he said. "It's just what I've often called the 'relentless rules of humble arithmetic,' " Bogle said. Those fees can eat up half of the money you would otherwise have down the road. "The tyranny of compounding long term costs because they eat you up," he said. Bogle showed that instead of hiring mutual fund managers to try to pick stocks, 80 percent to 90 percent of the time, you're going to make more money just buying the entire stock market. And that's what a broad-based index fund lets you do — just buy a big list, an index of stocks, of, say, the biggest companies in the U.S. Investing that way can be 10 to 20 times cheaper than traditional mutual funds with high fees. And Bogle showed with the index fund approach you're much more likely to make more money over time. That's why among the most popular investments now are low-cost funds that represent the S&P 500 index of the largest American companies. The pressure that put on the financial industry to lower costs has also brought fees down on many other types of investments — far beyond Vanguard's own index funds. And all this is why Bogle is celebrated as the George Washington of an investing revolution. "Jack Bogle has probably done more for the American investor than any man in the country," is how billionaire investor Warren Buffett summed it up at a Berkshire Hathaway annual shareholders meeting in 2017. Buffett invited Bogle there to honor him. "I estimate that Jack at a minimum has left in the pockets of investors, he's put tens and tens of billions into their pockets and those numbers are going to be hundreds of billions over time," Buffett said. He called Bogle a "hero." But while Bogle was a critic of greed and excess on Wall Street, he was also a big fan of capitalism. He spoke out, calling for young people — the leaders of tomorrow — to be more idealistic, follow his lead and clean up the mess: "The soul of capitalism, if you will," he said. "It's there to be fixed." A champion of people trying to save for retirement has died. Jack Bogle was 89 years old. He created the first index fund which became what economists regard as the bedrock most powerful tool for how everyday Americans should save and invest for the future. Bogle founded the low-cost investment firm Vanguard. NPR's Chris Arnold has done stories about Bogle over the years, and he joins me now. Hey, Chris. KELLY: So I know in your reporting you have referred to Jack Bogle as a George Washington figure. Except instead of the American Revolution - revolution on Wall Street. Explain. How did he transform investing? ARNOLD: You know, if you have a retirement account - anybody in America basically who is investing in the stock market has more money, chances are, because of Jack Bogle. And the reason is that in 1975, he created the first index fund, and that came to be, like, a shot heard round the world. What he was doing there is he was saying cost is everything. And he was challenging the high fees that financial firms like to charge people and say, look; you don't have to pay these high fees; there's a better way. And the competition that that created brought down the fees that are charged for everybody in their retirement accounts, whether you're in index funds or Vanguard funds or anything else. And it's put billions of dollars into the pockets of middle-class and everyday investors all around the world. KELLY: OK, well, help me understand exactly what this better way was. I mean, what was the big idea behind what he did with index funds? ARNOLD: Well, I got to spend a day with Jack Bogle at his house on a lake in upstate New York a few years ago. And that - he's a - also a very wonderful guy. Anybody who's ever met him just - you like him instantly. And here's the way he put this notion of Wall Street and the fees that they charge. JACK BOGLE: We live in this mythical world where we kind of believe the American way is if you try harder, you will do better, and if you pay a professional, it will pay off. And these things are true except in investing. ARNOLD: And his idea was with an index fund - if people aren't clear on exactly what that is, you buy a fund that owns, some of them, the entire stock market - like, all of corporate America. You, Mary Louise, can own all of corporate America or a very small slice of it for a very, very low cost. And research has shown that this is just a very effective, powerful way to invest. You make a lot more money over time, chances are, if you invest this way instead of paying a lot of fees for guys to pick stocks for you. And it's really worked for a lot of people. And Vanguard, the company he's founded, now has $5 trillion under management. ARNOLD: And he's changed the industry. KELLY: Wow. And interestingly, Jack Bogle himself - while he was making all of our retirement funds fatter, he actually took home a lot less money than you might think. ARNOLD: Absolutely. I mean, he's made nothing on the scale of the big hedge fund guys - very modest by comparison. And he really was more motivated about changing the world than he was about making money for himself. We should say, too, though, that while Bogle was a critic of Wall Street and its greed and its excess and all the things that are wrong, he was a complete fan of capitalism and wanted, like, you know, the young people and the future leaders to fix the problems and make it better, and it really is the best system in the world. He also had a ton of fans. I mean, the most famous investor in the world, Warren Buffett, was also a - really liked Jack Bogle. He said in an annual letter in 2017, quote, "if there's a statue ever erected to honor the person who has done the most for American investors, the hands-down choice should be Jack Bogle." KELLY: Wow. Thank you, Chris. KELLY: That's NPR's Chris Arnold talking about Jack Bogle, creator of the first index fund. He has died at the age of 89. Transcript provided by NPR, Copyright NPR.